Green gram split lentil popularly known as Moong dal in Hindi (मूंगदाल). Mung Dal is a complete package full of the essential vitamins like Vitamin C, Vitamin K to minerals like iron, calcium, potassium, magnesium, copper, zinc and many more. Moong Dal has great nutritional value. To top in all it is low in calories and is a high source of protein, fibre and antioxidants. It is light on the stomach and is a must in a sick person’s diet. The numerous Moong Dal benefits make it a necessary element of healthy eating. Mung bean (Vigna radiata) is a common food in India and China. It is known for its detoxification activities and is used to refresh mentality, alleviate heat stroke, and reduce swelling in the summer. The seeds and sprout of mung beans are widely in used as a fresh salad vegetable. A common food in India, Bangladesh, South East Asia, and western countries. High levels of proteins, amino acids, oligosaccharides, and polyphenols in mung beans are thought to be the main contributors to the antioxidant, antimicrobial, helps reducing inflammation, and antitumor activities of this food and are involved in the regulation of lipid metabolism. mung dal combats heart diseases. mung dal control diabetes level. moong dal sprouts helps in loosing body weight. mong dal have anti-cancer effects. mung dal sproutsis a good source of Vitamin C and K.
mung dal boosts the immune system. Moong daal sprouts is a good source of folate (a salt or ester of folic acid). mung dal improves reproductive health. So, knowing so much advantage of Moong Dal. Lets immediately start cooking this delecious moong dal tarka recipe. 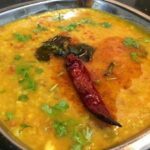 This recipe of Mung Dal flavoured with spices, tomato and onion is very tasty and not at all sticky. Moong Daal gets most easily digested among all the pulses.Dhaba Style Moong Dal Tadka Recipe is a lip smacking dal recipe seasoned with some herbs and spices. This is light on stomach recipe and tastes really yummy. And the most intresting part is that moong dal cooks quickly compared to other dal thus it very easy and quick recipe. Wash and clean the lentils thoroughly and soak it in water for 15-20 minutes. Moong dal can also be cooked without soaking it. 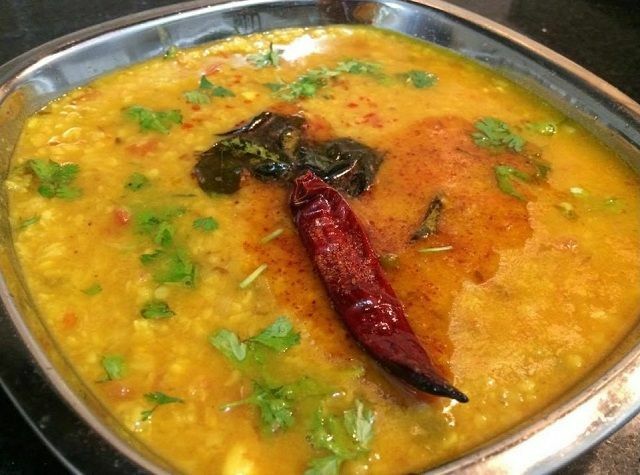 This dal can be made even after washing it quickly as it gets cooked very easily. First heat the cooker, add ghee and let ghee melt. When the ghee is hot, add cumin seeds. After cumin seeds gets fried, add turmeric powder, finely chopped green chillies, finely chopped ginger, and fry the spices lightly. After frying the masala, add finely chopped onion and fry till the onions gets translucent. When the onions become translucent, add finely chopped tomatoes, and fry the spices until the ghee starts separating from the spices. Now put the moong dal in a spice and fry it for 1-2 minutes with a spice. Put 2 cups of water and salt in the dal, mix it. Close the lid of the cooker and cook till the pulse gets 1 whistle. Turn off the gas when the whistle is over. Open the lid when the pressure of the cooker gets released. Dal is ready, transfer the lentils in a bowl. In a griddle put a small spoon of ghee and heat it. When the ghee gets hot add cumin seeds. Next add the garlic and whole red chili and fry for some seconds. As soon as the garlic turn golden, switch off the flame and don't let garlic turn brown. Then add red chilli powder and asafoetida in hot ghee, immediately and turn off the gas. Otherwise the spices will get burnt. Stir quickly, pour this condiment mixture in the dal. Delicious moong dal is ready decorate it with fresh coriander leaves. Serve it hot with chapati or rice.